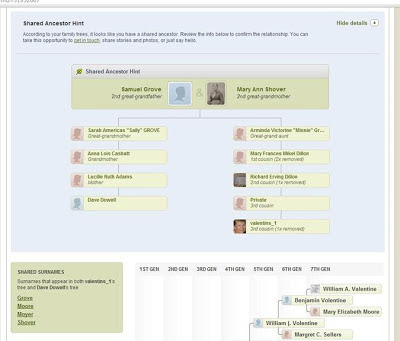 AncestryDNA Beginning to Come of Age? Ancestry.com’s autosomal DNA product is starting to come of age. Until last night I had not been impressed with what I had been able to find through it. I did make one find that was genealogically very significant for me. However, that find was rather tedious and cumbersome. 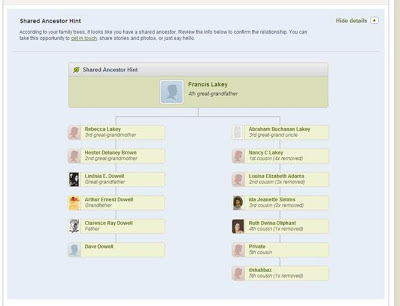 Ancestry's DNA product did play an important part in that discovery by pointing me to a potential cousin. But it was still an old fashioned, grind-it-out process of going through the pedigree tree of suggested match to find a name that looked familiar. This should be only a temporary delay in gaining access. However, in this case I have yet to see the desired tree three months later. This is in spite of several invitations from the owner of that tree and a call to customer service. Kim in customer service told me she found a mistake in the email address in my Ancestry profile. Even after that was identified, I am still not getting an invitation to that tree.There are three trees to which the owners recently have been trying to invite me. Only one of them finally has succeeded when she asked the invitation be sent to a private email address that is not associated with my Ancestry account. You can see why I was underwhelmed by Ancestry's new offering. It appears that the hint and that my suggested 4th cousin appears to be actually a 5th cousin-once removed! Wow, that was easy. I was ready to do that again and a few minutes later lightning did strike twice. In this instance my suggested 4th cousin appears to be a 3rd cousin-once removed. I tried many other suggested matches linked to extensive pedigree charts but found no obvious matches. Then I returned to the match I had previously found late last year and now the "Shared Ancestor Hint appeared. In this case the hint was technically correct but it showed the limits of this computer matching software. The DNA results predicted my match was a 4th cousin. The pedigree evaluation software matched us as 5th cousins. The DNA was correct in this case. The pedigree evaluation did not match "Debora LANHAM b. abt 1815 Kentucky" with "Deborah LANHAM ABT 1785 Virginia". This does not look like a technological failure to me. It looks like "pilot error" in the pedigree chart information to me. To mix my metaphors this is a small case of "garbage in garbage out." Ancestry still has much to learn about customer service. FTDNA and 23andMe notify me when I have new matches or when I receive an internal message from another customer. Ancestry waits for me to login and look for messages or new matches. 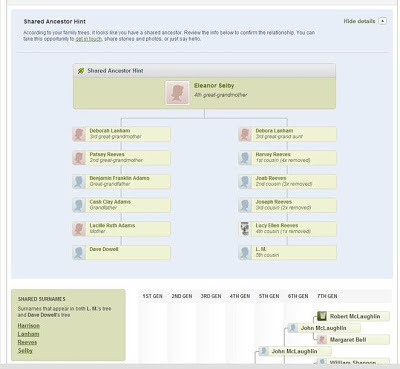 Ancestry needs to be more proactive in supporting the communications process between customers..
PS: Just as I was wrapping up this post, I noticed that there is another way to filter DNA matches "Has A Hint". I now have five more matches to investigate and they are predicted to be 5th or more distant cousins. Last night my wife forwarded me a Living Social promotion. She has been introduced to several local services and products through Living Social with which we were not previously familiar. Through Living Social we also found a very nifty bed and breakfast, in Danville, Kentucky called The Farm that both of us love. The introductory offer she found yesterday was to AncestrybyDNA. This company has been around for a while. However, now that Ancestry.com has developed a beta version of an autosomal DNA test, it appears that AncestrybyDNA is willing to exploit possible consumer confusion between the two products. A few comments on Yelp seem to confirm that this has been the case for some customers. 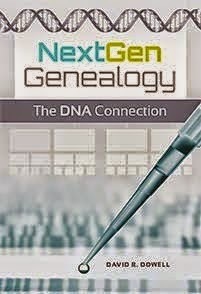 For a fuller discussion of this service, see CeCe Moore's review in her popular genetic genealogy blog, Your Genetic Genealogist. Whether or not customers are confusing these two companies, I agree with CeCe that even Ancestry.com's new autosomal test is not the gold standard in this market--at least not yet. Let the buyer beware. I have been scaling back on blog posts and some other activities since the first of the year to give more concentrated attention to a book project. However, I'll still make short posts for items that appear to be of use to readers. You may want to check out several of them. But don't forget that Thursday may be the most important day for Irish researchers until March 17th. 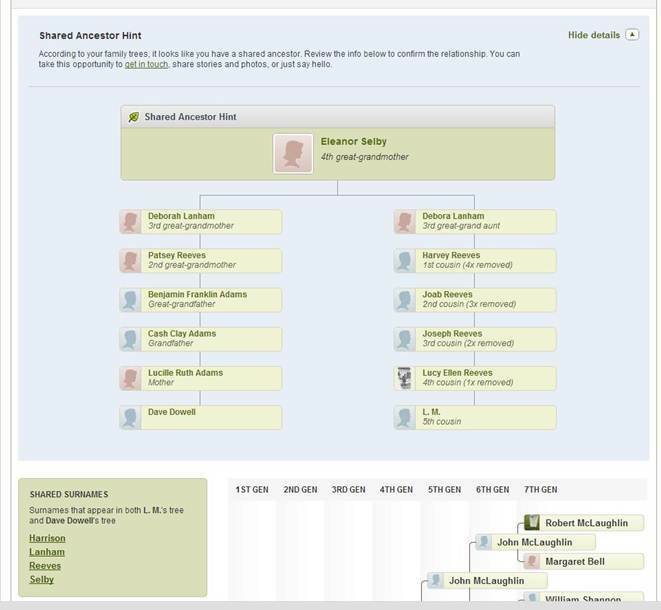 I recently discovered a pedigree chart on Ancestry.com which listed a son for my wife’s great –grandparents that I had not seen before. It caused me to go back and review what I knew about this family. The parents had migrated to Chicago from Germany in the late 19th century. The children that I knew about were born in Chicago in the 1880s and 1890s. Could there have been a son born earlier? After all he was living in a near north neighborhood of Chicago in the adjoining parish to that of his alleged parents. I went back to the 1900 census and found that the mother claimed she had given birth to 8 children of whom 6 were still living. The record for her household listed 6 children none of whom were the son listed in the pedigree chart. As I reviewed more records, I became more and more convinced that Joseph PAPKE was not the granduncle of my wife. However, I became increasingly intrigued by the names I was seeing in census, pedigree charts and other documents on Ancestry. When I had originally researched this part of my wife’s tree, I found Catholic Church parish records were invaluable in reconstructing the history of her mother’s family. I discovered these records on microfilm while researching at the Family History Library in Salt Lake City. These records were so valuable for showing christening, confirmation, marriage and death records for all members of families. In addition, information about the origins of the parents and the names of sponsors and godparents was also instructive. I soon ordered the microfilm and renewed it twice so that it became a permanent loan to the Family History Center near my home in California. There it was available to be consulted as my research unfolded. However, a year ago Denise and I moved 2,100 miles east of the Central Coast where the microfilm is housed. With these newly discovered possible distant family members, I wanted to consult these records again. I am planning to be in Salt Lake City in March to attend RootsTech and to spend a few days in the Family History Library. Looking forward to that trip I consulted the library online catalog to plan which rolls of microfilm I would need to consult. When I did I got a very nice surprise. These parish records have been digitized and can be consulted online! The records are a gold mine that often has much information not included in civil records for the same events. Priests often made interesting marginal comments. Approximately 300 rolls of microfilm images of Chicago church records are now available. Most of them are Catholic parish records covering events in the late 19th and early 20th centuries. If I had not found the mistaken pedigree, I would not have discovered that these records had been digitized. I plan to use them extensively. I’ll leave you with one other tip for those of you researching early 20th century Chicago ancestors. At the turn of the 20th century Chicago streets and numbers were a ragtag unorganized mess. In 1909 and 1911, most street addresses in Chicago were changed to create the logical grid of addresses the city now enjoys. In the process street numbers could have been changed by what would appear to be many blocks even if the occupants never moved at all. In some cases even the street names changed. You can access a resource digitized by the Newbury Library which explains these changes and gives a very thorough translation chart from old address to new address or vice versa. This and other Chicago research tools are available at under the “Tools” tab of Chicago Ancestors.org.